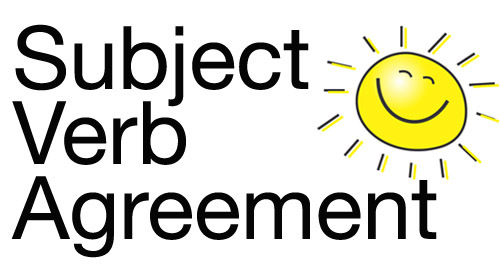 Subject-verb agreement refers to the number of the subject (whom or what a sentence is about) and verb (what the subject is or does). You must use a singular subject with a singular verb and a plural subject with a plural verb. When this happens, we say that the subject and the verb agree. Isn't that nice? Remember that singular means one, and plural means more than one. Subjects will always be nouns or pronouns. If you are unsure what a plural verb looks like, know that many singular verbs end in s while the plural form of the verb does not - just like run/runs above. However, this is not true for the to be verbs. Compound means two or more. The rule above is straightforward and easy to remember when you have one subject, but what happens when you have two or more subjects? 1. For singular compound subjects joined by and, use a plural verb. My sister and brother walk to school. 2. For singular compound subjects joined by or or nor, use a singular verb. A lamp or clock is in the box. 3. For plural compound subjects joined by or or nor, use a plural verb. Neither lamps nor clocks are in the box. 4. For compound subjects that are both singular and plural joined by or or nor, use the verb that agrees with the closest subject. Neither Jennifer nor the boys are in the race. Either the boys or Jennifer is in the race. I have spoken English all my life and never knew all of this. Thank you so much for your grammar courses. They are truly amazing!!! Try these subject-verb agreement exercises.